A lovely set of four guest hand towels loomed of a pure white and fresh linen/cotton damask blend. 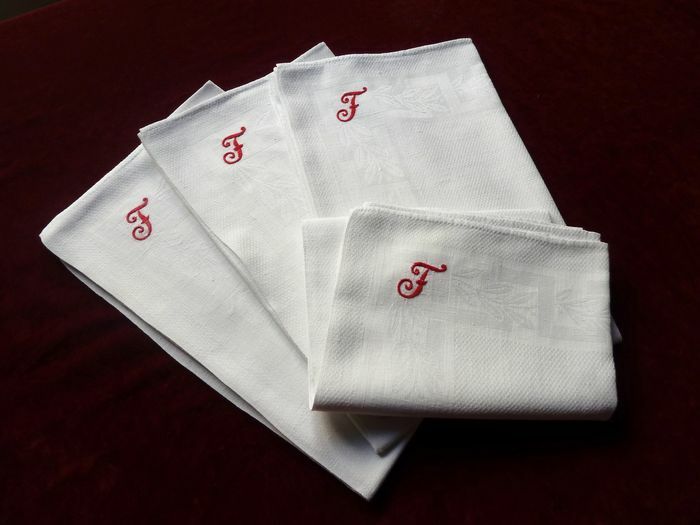 These pretty towels each have a single monogram "F" embroidered in a fine red chainstitch in one corner. The damask has an overall pattern known in French as "oeil de perdrix," or eye of the partridge, with a handsome large border of stylized leaves. The hems are hand-stitched with miniscule points. Likely dating from the early to mid 20th century these towels are in impeccable, as-new condition. (Two additional sets of four towels are available upon request.) Dimensions: 28.5 x 26in.